Dane Richards and Danny Cepero. One was benched late in the season. The other was thrust into the lineup just four games ago. But today, those two names will forever be etched into Metro history, for Richards and Cepero amazed, the former setting up all three Metro goals, and the latter playing out of his mind, shutting out the league champions. If you are a Metro fan, to say that the bad moments outweigh the good ones is an understatement of the century. Yet time after time, loss after loss, we tell ourselves: it will get better. It will get better. It never did. There were so many heroes today: Richards and Cepero. The entire defense: Kevin Goldthwaite, Diego Jimenez, Andrew Boyens, and Chris Leitch. Luke Sassano, who shut down the Houston attack. Sinisa Ubiparipovic, and Dave van den Bergh, and Juan Pablo Angel... And John Wolyniec, how can we ever forget John Wolyniec, who finally got his first goal of the year. And Osorio. Definitely, Osorio. Yet early into the match it looked like the list of heroes would not come from the Metro side. Houston attacked and attacked, and looked to break through. The Metro defense bent, but didn't break. What broke was the Houston defense, as in the 25th minute a long low pass from Ubiparipovic split the middle of the field, with Richards running onto it. The Jamaican, in between two Dynamo defenders, took a few steps, and blasted it (That's right. Dane Richards BLASTED it.) for the surprising lead. 11 minutes later, it was Richards again. Taking the ball up the right flank, and using his head to knock it to himself and keep possession, he sent a cross that hit the hand of former Metro Ricardo Clark. The referee pointed to the spot, and Angel coolly converted, high and to the left. Metro was up two. They stayed up two after a frantic play immediately after the goal. Cepero came out of the nets, attempting to clear the ball, but Houston's Brian Ching kept possession, and had an empty net to shoot at. 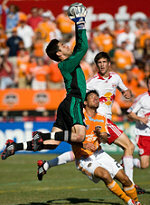 Cepero launched himself backwards, grabbing the ball in the air and stupefying the Dynamo attacker. Cepero would come up big time after time in the second half. Saves of every variety: pushing the ball over the bar, a kick-save from close range... He might have scored a goal on his debut, but tonight he arrived as a player. The job is not done. Salt Lake on Saturday, and then... who knows? Lineup: Cepero, Goldthwaite, Jimenez, Boyens, Leitch, Sassano, Richards, van den Bergh, Ubiparipovic, Wolyniec, Angel. Subs: Kandji, Mendes.